I am well aware that my sabbatical blog has fallen dormant for a while, but I do feel that I need both there and here to record what my Sabbatical time has given me. I guess more than anything else it has given me a chance to not just do all of that by time also to experience that profoundly in myself. I am not wanting or meaning to sound pretentious but it has given me time to become renewed and refocused spiritually, physically, mentally and emotionally. I can feel that in my body. I warned you it might sound pretentious! Today I was presented the gift of time with a friend and colleague, David Brooke, with whom I did my post-Ordination training. David is now on Sabbatical himself and he stopped by our place to rest, recover and renew our friendship. David is cycling to Santiago de Compostela in north-west Spain and his blog about his long journey can be read here. The journey seems hardly all that I mention above and yet I hope and pray that he will, despite the miles he must cover, experience the list above deep within his being. As I stand on the edge of the end of my time off, I am aware that together with my church, we stand on the beginning of something new that God is longing to do amongst us. Some of those new things will be small changes in our worshiping style, some will be encouraging involvement in deeper ways in the life of the church and community, but most of what lies ahead at this stage in unknown to me. Now if you are a member of my church reading this you might be wondering why I had this time off in the first place if I wasn't going to come back with new plans and vision. And yet, as we wait, like those first disciples, for the coming of the Holy Spirit, that is perhaps a clue to what we should be as of now. 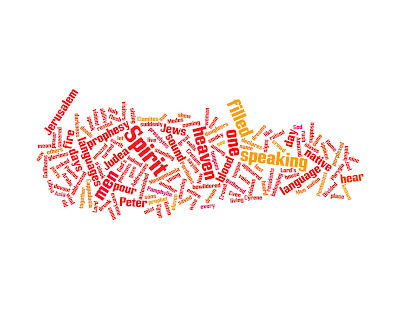 Those disciples were told to go and wait in a particular place for the Spirit's coming. As we wait for the next phase of stage of God's plans amongst us we too must wait, wait on God. We must pray and ask him to reveal clearly to us his plans and purposes for his church here and for our wider community. Prayer must be key to discerning what God's plans and purposes for us are. Another thing to mention is that I never hoped that I would come back with plans and new initiatives for I am not our church - we are. I hope that alongside the prayer will also come a long period of consultation with the church and the wider community as a means to discerning some aspects of vision and direction over perhaps the next five years. Over my time away from parish ministry I have also reflected much on the meaning of our central act of worship - the Eucharist. One thing I have become clearer on though is the word Eucharist means 'thanksgiving' and the thanksgiving we are called to participate and share in is the thanksgiving of all creation for the saving love of God in Christ. This thanksgiving is something that also spills out of a particular building on an particular day into the whole of our lives and from our lives into the whole of our existence. 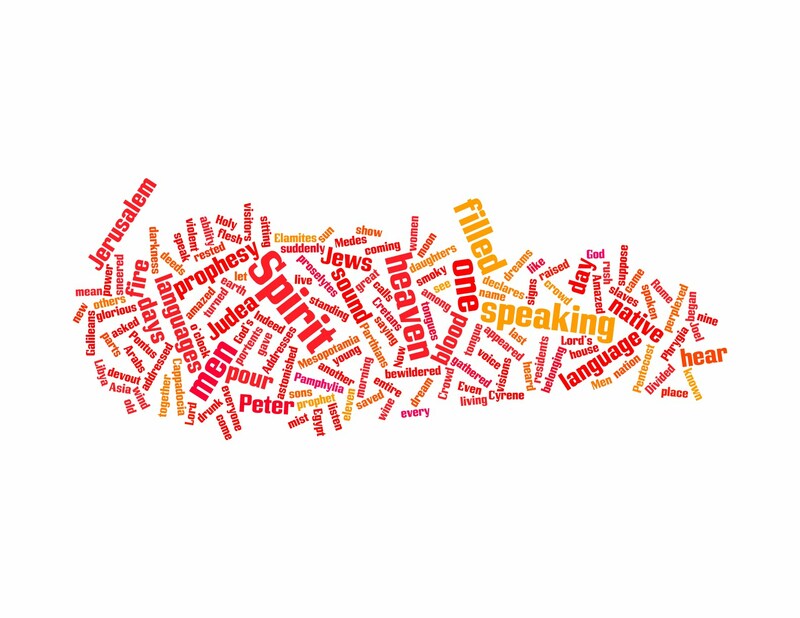 As we seek God's continued leading of us in all things, here is the Wordle for Acts 2:1-21 - one of the key readings that we will use on Sunday. God longed to continue the ministry of Jesus in all people. This would happen through people being filled with the Spirit giving them courage and confidence to speak of their, of our experience of God to all people... including us men!